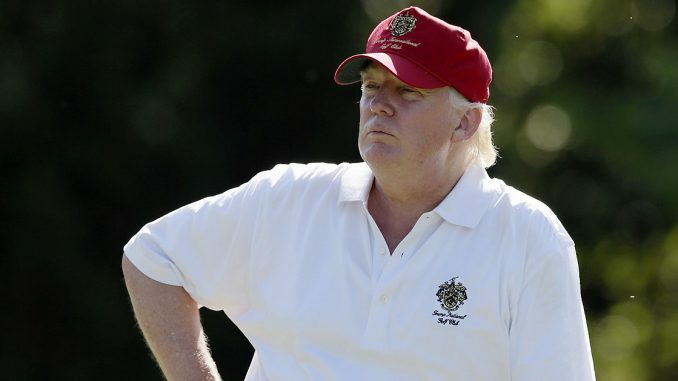 (Mar-a-Lago) Unconfirmed sources report that the inhabitant of the White House, Mr. Trump, has spent more time golfing than working on Heath Care reform. Actually, a careful study of Mr. Trump’s schedule has determined that he has spent about 6.2% of his waking hours as President on the links. Mr. Trump is indeed well ahead of any past President when it comes to golfing. It took several weeks for President Obama and President Bush to hit the links for the first time after assuming the office. At this rate, Mr. Trump could break the 300 round mark by the end of his first term. It took President Obama two entire terms to hit the 330 mark. At this rate, Mr. Trump could break the 300 round mark by the end of his first term. It took President Obama two entire terms to hit the 330 mark. At 5 hours per round, 4 hours of golf and an hour of changing and hanging round, Mr. Trump has spent 70 hours golfing. So, Mr. Trump has spent 2 of his 9 weeks in office golfing. Let’s hope his handicap is improving. Sarah Palin: Role Model? The answer is more than just a punch line.